Glasgow has a large number of castles within the general area, but many of them are closed up and not open to the public, although they can be seen from publicly accessible locations. As a cathedral town, Glasgow was dominated by the church, but the town expanded to include many outlying areas which were historically parts of different lordships. Here are what I believe are the best castles in Glasgow to visit. 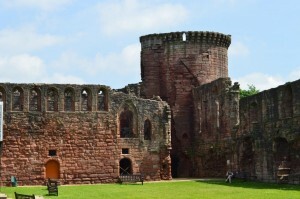 First is Bothwell Castle, a few miles to the south-east of the city proper, but easily reached. A massive ruined courtyard castle which dates to the 13th century, it is picturesque and grand, and with a very interesting history including a famous siege by the English. Managed by Historic Scotland, it is a very impressive fortress. Second is Crookston Castle, the substantial remains of a tower house within the earthworks of an earlier castle on top of a low hill. It is free to enter, and from the roof there are fantastic views. Bear in mind that the metal ladder reaching the roof is narrow and steep, and that the opening hours appear to be determined by when they feel like closing the gate! Third is Dumbarton Castle, a few miles outside Glasgow and the original capital of the kingdom of Strathclyde. Not much remains of the medieval castle, which remained in military use for a very long time, but a good impression of the garrison fortress can be gained, along with great views from the top of the rock . 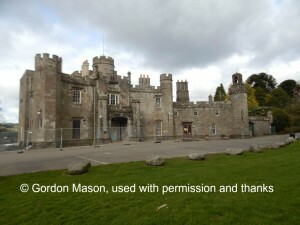 It is a Historic Scotland property. Fourth is Craignethan Castle, a bit further out than Bothwell. It is a fair walk from the car park, but well worth it, a squat tower-keep behind massive early artillery defences and a later courtyard. 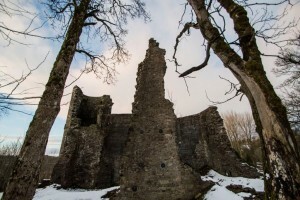 It was built by James Hamilton of Finnart, and is claimed to be the inspiration behind Sir Walter Scott’s Tillietudlem, although he always denied it. It’s also Historic Scotland. 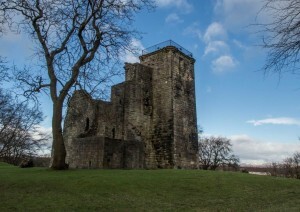 Newark Castle is a few miles to the west of in port Glasgow, and is roofed. 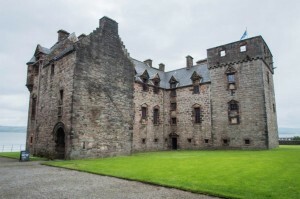 It is a Historic Scotland property, and has many interesting features although most of the courtyard has disappeared. Looking out over the Clyde it is an impressive example of a large tower house enabling a proper understanding of how spacious and well defended these buildings were. 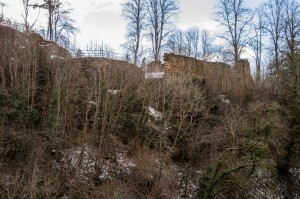 Within Chatelherault Park and overlooking a ravine is Cadzow Castle. At present it is undergoing restoration works, so is unfortunately fenced off, but the Park has good facilities. It is again quite a stiff walk but the views in the park are beautiful and worth the trip on their own! Another castle within a country park is Mugdock, a ruined castle dating from the 14th century. The park has many facilities, and the castle is open regularly but check the official website for times. Mugdock is a few miles to the north-west of Glasgow, and has free entry and parking. The third country park with a castle is Balloch, at the southern end of Loch Lomond. The original Balloch castle site does not have any stonework left standing, but the earthwork ditch and mound can be found within the park. Most people only see the 19th century mansion called Balloch Castle which overlooks the old castle site, but it is worth the walk down for a look. Strathaven Castle is in the centre of the village of Strathaven to the south of Glasgow. 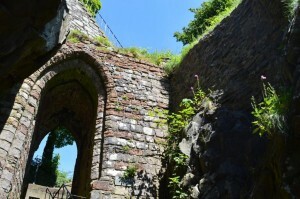 The castle ruin is open at all times and what is left is a single tall wall and round tower of a large tower house, plus another separate section of wall; the other remains are much lower. It was built in the 16th century, but is on the mound of a much earlier castle. Within Glasgow itself other tower houses can be seen, but are not open to the public, like Johnstone, Mearns and Barr. 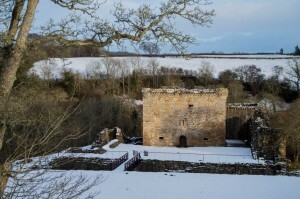 Other castles have been replaced by later mansions, some of which have accessible grounds, like Cumbernauld, and a few, like Kirkintilloch and Cathcart, survive only as earthworks or stone footings. There is even one castle – Staneley – which is in the middle of a reservoir and is flooded! Glasgow Castle itself has long since disappeared, but was near the Cathedral. Glasgow and the surrounding area contains many more castles than the visitor might think, and I am indebted to Gordon Mason for his knowledge and guidance around the sites.